From BEGIN’s Hana to Kina’s Hana, Anne Ku is on a quest for nostalgic songs of Okinawa. No sooner than finding sheet music to BEGIN’s Hana, my retired Japanese language professor friend in California introduced an even more nostalgic song from Okinawa. It’s also called Hana. The composer is Kina Shoukichi (喜納昌吉). Chicago’s Colour My World has a hypnotizing effect with a distinct bass line and slow changing broken chords. Anne Ku rewrites it for easier reading. “What is the song that goes like this?” asked one of my piano students out of the blue, playing a distinct major 7th chord followed by minor chords on his right hand. It’s one of those songs that you never forget. 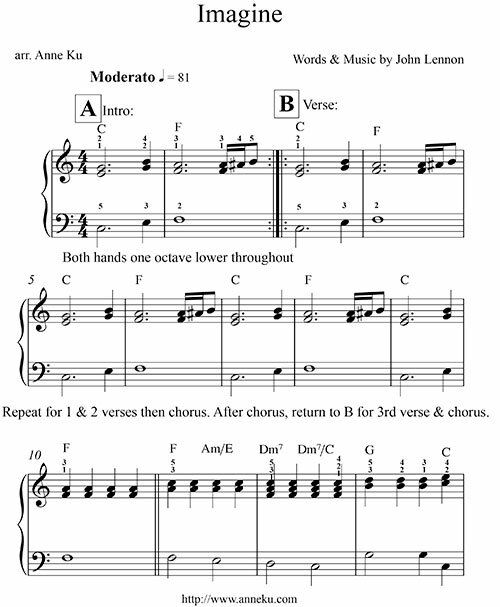 Anne Ku arranged four different versions of John Lennon’s Imagine solo piano accompaniment for different levels of playing. 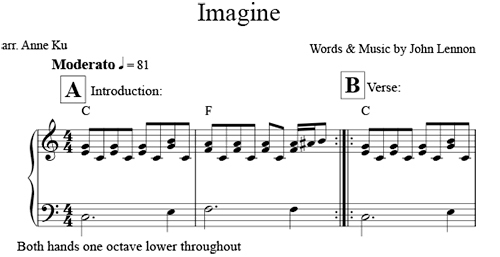 John Lennon’s Imagine is a song with piano accompaniment in the key of C major. These days, you can play a well-tuned piano to his official video on youtube, as we did in class to any number of versions I arranged for the different levels of my adult piano students. 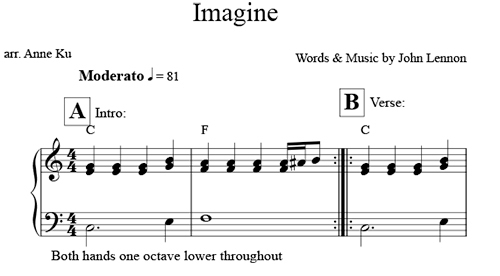 In all versions, both hands are to play one octave lower than what’s written. Click on the excerpt to download the full PDF version. It’s Christmas come early. Slightly more difficult is the following version because I left out the fingerings and the right hand has to do a little more work than before. To imitate the authentic piano arrangement, we need repetitive broken chords in eighth notes, on the right hand. Finally, for those whose left hands are powerful enough to play octaves, here’s another version. South Korean composer and pianist Yiruma wrote and performed “River Flows in You” often confused with piano music from the “Twilight” saga. It’s not but it’s very sticky nevertheless. The first time I heard it on the piano, I thought it was a variation of Einaudi’s music. When I heard it again, I realized it was something else. After my piano class, a student from the next class started playing it on the piano just as I was leaving. “River flows in you,” she said. I don’t remember this piece. Who is it by? The sticky melody caught my attention. It’s been a long time since I’ve been caught off-guard like this. How could I not know the composer or the title of the work? I have watched all 5 movies of the Twilight Saga and don’t recall this piece at all. The closest one was Carter Burwell’s Bella’s Lullaby, which does not sound like this. Rather, the piece I heard on the piano was “River Flows in You” by Yiruma, the Korean pianist who has lived in the UK. 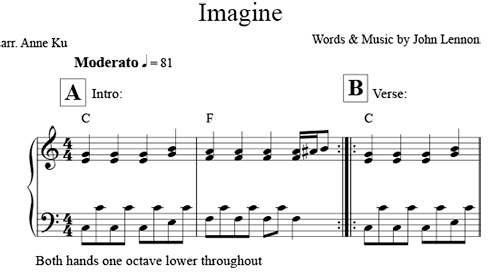 The sheet music of his works are freely downloadable from his website. Compare the difference, below. My next step? Check out Yiruma’s music and sightread them all. What is his music so sticky? Maybe that could be project for my students.